Written by: Rebecca Miller on February 28, 2015. Leonard Nimoy, 83, passed away at at his Bel Air home in Los Angeles Friday, February 27, 2015 of end stage chronic obstructive pulmonary disease. Nimoy had announced he was suffering from the condition last year. Nimoy, better known as his character from Star Trek, Mr. Spock, with a stage, screen, and television career spanning over 60 years, has left an indelible mark on our culture to this day. The son of Yiddish-speaking Orthodox Jewish immigrants began acting as a child in local and children’s theaters in his home of Boston, Massachusetts. He entered the Army in 1953, eventually serving in Army Special Services in which he wrote, narrated, and emceed programming and even starred in a film for the Navy on Combat Psychiatry during the Korean War. Leaving the Army, he began working in Hollywood, mostly as a “heavy” in film and on such television shows a Perry Mason, Bonanza, Rawhide, The Untouchables, Twilight Zone, The Outer Limits, and Dragnet. He began to receive more small rolls in films, such as an Army sergeant in the 1954 sci-fi classic Them. While on the set of The Man from U.N.C.L.E., shortly before his most iconic role, he met and forged a friendship with another actor that would last his lifetime: William Shatner. Nimoy went on to say later of this friendship, “We were like brothers.” Spock, a role that Nimoy had a love/hate relationship with over the years, became the role that he was most recognized as, even going as far as to name his first autobiography, I Am Not Spock in 1975. Despite this original resentment with being recognized more for his character than for himself, he did come to terms with this later in life, titling his second autobiography, I Am Spock in 1995. Nimoy was much more than Spock though. Raised in an Orthodox Jewish family, he embraced his faith. He produced a film, Never Forget, based on the pro bono lawsuit of William John Cox on behalf of Mel Mermelstein whom Nimoy played, an Auschwitz survivor, refuting Holocaust deniers. He stated in 1995, “If every project brought me the same sense of fulfillment that Never Forget did, I would truly be in paradise.” He also lent his voice as a narrator and voice artist for such programs as NBC’s In Search of…, The History Channel’s Ancient Mysteries, and animated film Atlantis: The Lost Empire in 2001, voicing Galvatron for the Transformers: The Movie in 1986 and Sentinel Prime in Transformers: The Dark of the Moon in 2011. Not only was Nimoy an actor, producer, and writer, but he also was a photographer and recording artist, producing 5 albums with Dot Records, the first being Mr. Spock’s Music from Outer Space. He went on to do several more albums with songs with science fiction, cover versions of popular music, and folk music themes, incorporating singing and spoken word. Some of the more memorable of these songs being Proud Mary and Ballad of Bilbo Baggins. Among the Geek Girls and our friends, we all have our own memories of Nimoy. Our own Geek Girl Sara shared her thoughts on her blog, Queen of My Geekdom. As for myself (Geek Girl Rebecca) Spock has always been a part of my life and growing up. My mother introduced me to Star Trek when I was 5. The first episode I really remember was “Spectre of the Gun.” I know it’s a strange episode, with the crew being forced to relive the Gunfight at the O.K. Corral, but I was so impressed by how Spock was able with logic and control to help the others overcome their fears that the aliens were using against them. Also a quote from “I, Mudd” is my go-to when I am absolutely frustrated with people being irrational and confusing, “Logic is a little tweeting bird chirping in a meadow.” Spock is the logical part of my childhood, the part that has always helped me sort through and look at things rationally. As I told my editor Allie, the longer I worked on this article the more it went from facts to feelings, and she pointed out, that it’s like Spock: half Vulcan and half human. He helped us be a little bit more of both. Tributes to Nimoy have come in every imaginable way. People have baked cakes, drawn art, and written poems, such as “A Man Who Taught Me” by bleeding-from-a-black-heart. Garrett York, who took the above screenshot in MMO Star Trek Online, said, “Today, players have been coming and standing silently around the fountain at the bottom of Mt. 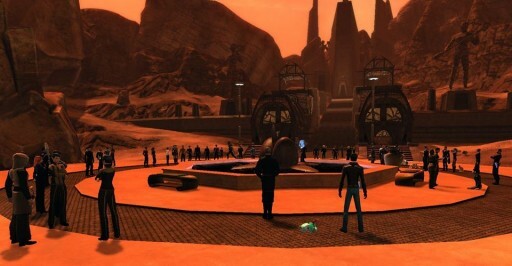 Seleya as an impromptu memorial.” A permanent in-game memorial will be added to the game on Thursday, according to Steve Ricossa, Executive Producer at Cryptic Studios. The Nimoy family has recommended a few charities to support if you wish to make a donation in his memory. Our hearts go out to Mr. Nimoy’s family and friends. I have always been so impressed and admired Nimoy as both his character and as a person of faith. Live long and Prosper, Mr. Spock. May you have peace, you have had a long life. Thank you for this wonderful memorial! 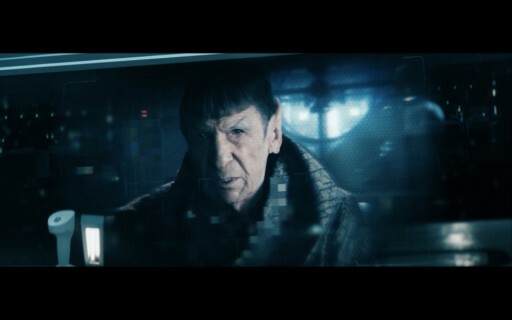 I am also grateful Nimoy had the chance to appear as William Bell in Fringe. I think he really appreciated that.